The Lake's Edge Gift Shop is your one-stop shop for quality gifts in the Heart of the Park! 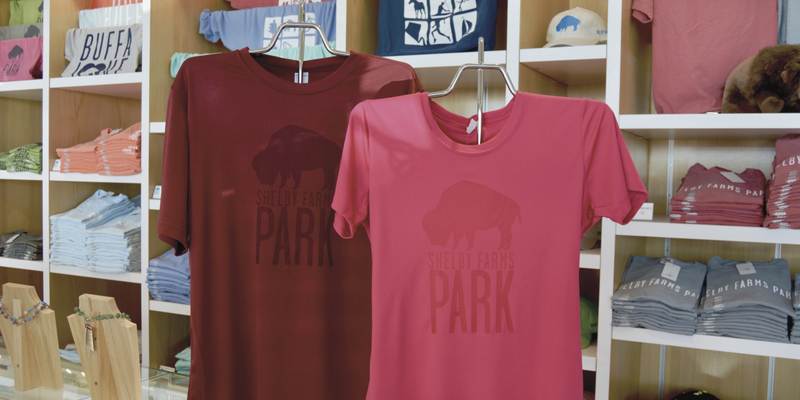 Looking for a great Shelby Farms Park hat or T-shirt? Maybe a new coffee mug or a treat for your four-legged friend? The Lake's Edge Gift Shop has all this and more! The gift shop also carries frozen pops from MEMPopS, ice cream treats, snacks and cold drinks. Shop 24/7 at our Web Store! Gift Certificates | Plush Toys | Dog Gifts | ...and more! Shelby Farms Park: Elevating a City is a new 272-page book that describes the history and improbable journey of Shelby Farms Park through a combination of compelling stories and stunning photography. See the Park like never before. Makes a great gift! All proceeds from the book benefit Shelby Farms Park Conservancy. As you check out, be sure to participate in the Buffalo Round Up -- round your purchase up to the next dollar to help feed and care for our buffalo herd! All purchases help keep Shelby Farms Park and Shelby Farms Greenline clean, green and safe.